Hi Irene how are you? I hope all is well with you. How is school going? What is your favorite subject? When I was in school my favorite subject was Biology. That is why I want to be a Biology teacher someday. I would like to tell you about a phrase or a sentence that I believe in, these are words that I live by every single day. 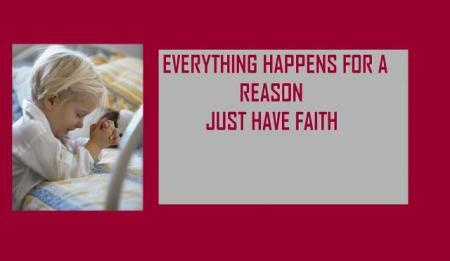 “Everything happens for a reason”. I heard these words from my Mom. They have become my motto in life. I believe that all that we go through, all of life’s ups and downs, happen so that we can learn something from them, they happen for a reason. As long as we believe that everything that we go through has an ultimate purpose we will be fine and we will be strong enough to go through anything. Just have faith.